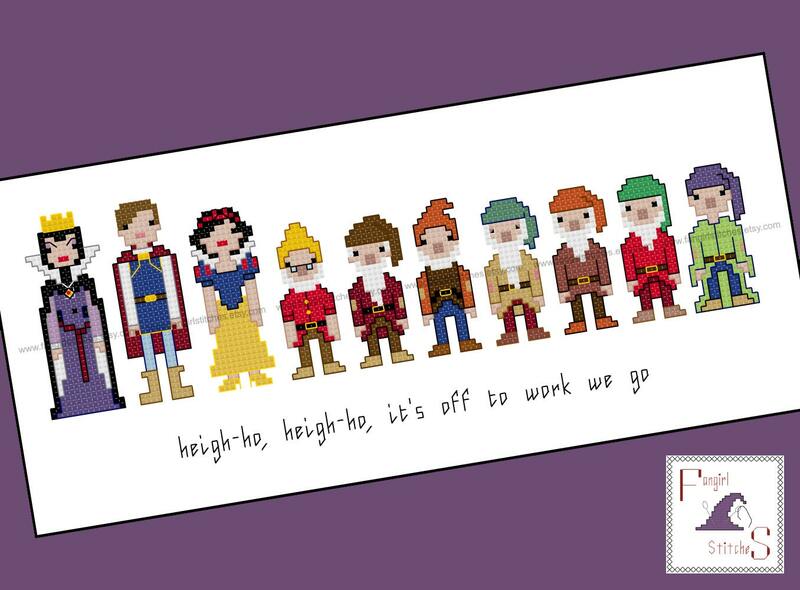 "Heigh-ho, heigh-ho, it's off to work we go"
This listing is for a cross stitch pattern featuring Disney's oldest Princess, Snow White. Also include in the lineup are the Evil Queen Grimhilde, Prince Charming and the seven dwarfs. Fabric size: at least 17 x 12 inches (14 count aida, 28 count evenweave) - depending on how you want to finish off your project. This piece will fit an A4 frame. This design includes whole stitches and back stitch, with a couple of French knots. It is suitable for beginner looking to stretch their skills stitchers. The pattern comes with two charts - a colour chart and backstitch chart. It also includes a guide for starting and finishing your project. The floss key is in DMC and Anchor threads, although of course you can adapt it to suit your preferred brand of thread, or those left-over threads you have on hand. This is a parody (inspirational) work. Disney and its characters are registered trademarks of the Walt Disney company. This production is not sponsored, endorsed by or affiliated with The Walt Disney Company. or any of its subsidiaries or affiliated companies and/or third party licensors.